Before you hit the road on that holiday vacation or business trip with a mindset of maintaining a healthy diet regimen, beware! What you �think� you know about healthy food choices can hurt you. Eating healthfully can be extra-challenging when you are out and about, whether traveling remotely, in transit from point A to point B, or dining out locally. Diet salad dressings are equally, or more, detrimental. Opting for a salad even with �light� dressing when dining out may not be the healthiest choice. Whether it is low calorie, low fat, or regular salad dressing, it�s often loaded with omega-six polyunsaturated plant oils�too much of which is associated with an increased risk of cardiovascular problems. In fact, consuming too much of these salad dressings can be even more harmful to your waistline and overall health than what you presume to be �less healthy� menu items you were trying to avoid with the best of intentions. When opting for salad, stick with just a little olive oil, vinegar, fresh lemon juice or nothing at all. Burgers beat deli meat. Despite conventional thinking, the consumption of fresh red meat that isn't over processed has not been associated with any increased risk of heart disease, cancer or mortality. Many restaurants today, outside of the fast food variety, offer freshly ground, quality burgers�some even use beef that�s organic, grass fed and pasture raised. In contrast to fresh red meat, the consumption of highly processed meat and meat products like that typically used in deli sandwiches often presumed to be a healthier option over burgers- are proven to be associated with an increased risk of heart disease, cancer and mortality. Piling on a few zombiefied vegetables that have marginal nutritional value won�t give the meal much more health merit. Under-salted food may be a diet disservice.We season our food so it tastes good, and a properly seasoned meal leaves us more satisfied and less likely to binge and over-consume. What�s more, adding salt to fresh food only accounts for about 5% of the daily intake�well within bounds. But, �fresh� is the key word as over 75% of an average person�s daily sodium intake comes from eating highly processed and prepared foods. Seek out those restaurants that utilize fresh ingredients, from produce to proteins. In a worst case scenario stop into a market and grab some fresh fruit, optimally organically grown, to tide you over. Low cholesterol advertising is a fat trap.Most are surprised to learn the cholesterol consumed in one�s diet has little or nothing to do with your blood cholesterol levels. Foods and menu items promoted as a �healthy� because they are �low in cholesterol� are often loaded with fat, sugar or other additives that cause more harm than a three egg omelet ever could. Bars are bogus. Energy bars, protein bars, granola bars and other so-called healthy eating snacks are often marketed as an all-natural or otherwise nutritious choice. The fact is that many of these bars are highly processed and contain high levels of low-nutrient fillers and sweeteners like high fructose corn syrup (HFCS). Diets high in added sugars, fructose in particular, has been associated with an increased risk of developing hypertension, obesity, cardiovascular disease and other life-threatening medical conditions.Bars are also often loaded with artificial sweeteners such as aspartame that�s linked to a myriad of health ailments. The short term energy boost bars provide are often followed by a �crash� that can cause you to eat yet more unhealthy bars or other food to get revved back up. Bagels are the �other� white bread. Many people are aware of the empty calories and the lack of any nutritional redemption in a slice of white bread. Commercial breads are the number one source of sodium in the average American diet. They also often contain significant amounts of refined sugar and fat in the form of detrimental omega-six polyunsaturated fatty acids. While many health-seekers do already avoid that slice of white bread for these many unappealing reasons, they may not know a seemingly benign plain bagel is equivalent to several slices of white bread�even before the addition of toppings or fillings. Counting calories is a fallacy. A calorie is measured by turning food to ash and recording the amount of heat given off. The caloric content of a food or beverage item doesn't have much to do with how we actually metabolize our food. Additionally, calories alone do not accurately reflect a food�s nutritional value. For example, a 100 calorie soft drink is not the nutritional equivalent of a 100 calorie apple. Healthful eating isn't about focusing on the quantity of calories, but rather it is about the quality of the consumable. Whether you are at home or on-the-go, taking even these few considerations into account relative to the quality of the �healthy� food at hand can have a significantly positive impact on your diet and overall well-being. Indeed, the food and drink choices you make when traveling can put you on the road to good health or result in a figurative food fatality. Dr. Mike Fenster, �America�s Culinary Interventionalist,� is a Board Certified Cardiologist, chef and athlete who�s cutting-edge medical expertise and insight, culinary talents and dedication to fit living convene in his uniquely integrative Grassroots Gourmet� approach to food-born health. His upcoming book �The Fallacy of The Calorie: Why the Modern Western Diet is Killing Us and How to Stop It� is currently available for pre-order at www.cardiochef.com. Prepare ahead of time. Research the rules of your particular airline to find out what luggage requirements they have. If you plan to leave from a busy airport, give yourself enough time to go through security and make it to your gate � even if there are long lines. Prior planning will help relieve stress. Don�t pack more than you can lift. The number one pet peeve of flight attendants is passengers who bring carry-on luggage too heavy for them to lift. Don�t expect the flight attendant to lift your bag into the overhead bin. If you pack it, you stack it. Or flight attendants will check it for you. Check before you recline. Airline seats recline to allow passengers to sleep and relax, but it may cause discomfort for the person behind you. If you intend to recline your seat, do it gently or better yet, turn around and make sure you don�t inconvenience the person behind you. Raise your seat during mealtime so the person behind you can enjoy his or her meal. Be respectful of those around you. Airplane seating is tight and interaction with your seatmates is inevitable. Keep the volume of your headphones at an appropriate level and lower the light on your electronic devices so you don�t disturb or distract the person next to you. Many people are sensitive to strong scents including garlic and onions so be mindful of what you eat on the plane. Allow those in front of you to disembark first. Rather than grab your luggage and make a run for the door, follow protocol. If you need to make a connection or know you�ll be in a rush, try to arrange to be seated near the front of the plane. Hold your tongue. If you have a complaint about another passenger, don't take matters into your own hands and don�t demand that the plane land at the nearest airport. Alert the flight attendant. Parents, be prepared. When babies cry uncontrollably in flight it�s probably because their ears hurt from the air pressure. It�s a good idea for parents to be prepared with a bottle or a pacifier or something to make their children swallow and relieve ear pressure. Smells travel. Parents should not wait until the plane takes off to change their baby�s diaper. Change your child�s diaper in the lavatory � not on the tray table. Fall is here. School is back in session, the trees are once again changing colors and, of course, that means Halloween isn�t far behind. While a little extra sugar consumption may be unavoidable during this time of the year, between the crisp caramel apples and Halloween candy hitting the shelves, it doesn�t mean you have to overload on the salt as well. As people start packing their summer clothes away and digging for their warm sweaters, it�s the perfect time to change up your recipes for seasonal, heartwarming fare. LoSalt, a reduced sodium salt with 66 percent less sodium than regular table, sea and rock salts, can be used to add a healthy kick. �LoSalt offers a positive step toward helping consumers lower the sodium value of recipes without losing taste,� said Jo-Ann Heslin, registered dietician and nutritionist and author of 29 consumer wellness and nutrition books. South Carolinian Nathalie Dupree offers up a soup recipe incorporating LoSalt. Dupree is a best-selling author with 13 hardback and two softback cookbooks and more than 300 television shows for The Food Network, PBS, and The Learning Channel. She was awarded the prestigious �Grand Dame� of Les Dames d�Escoffier, an international organization of top women in the culinary field, as well as 2013 Woman of the Year by a prestigious organization of French Chefs in America. Don�t sacrifice any salty taste, and try out these delicious fall recipes. This rich golden soup is uniquely Southern with the sweetness of the potato enhanced by the addition of the bourbon. Of course, it could be served completely smooth, but I like it part chunky. It may be made several days in advance and reheated, or frozen. Melt the butter in a large skillet. Add a layer of potatoes and brown on both sides. Remove and repeat until all are browned. Add 5 cups of the chicken stock. Cook, covered, until the potatoes are tender enough for a fork to pierce them easily. When they are tender, pur�e the solids using an immersion wand blender, food processor, or sturdy blender, adding liquid as necessary to create a smooth texture. Return to the soup. Taste. Stir in as much of the remaining cup of chicken stock as is necessary for a medium-thick soup. Add the bourbon and bring to the boil. Season as needed with LoSalt and pepper. Roll the greens into a cylinder shape and sliver. Stir into the soup. If canned chicken stock or broth is purchased for the recipe, LoSalt recommends a low-sodium option. 2. Halve the squash lengthways, scoop out the seeds then cut away the skin or peel with a vegetable peeler. Cut into large chunks and scatter into roasting tin. Toss with a few tablespoons of olive oil, season with LoSalt and roast for approximately 30 minutes until tender. 3. Tip the butternut squash and any sticky pan juices to a large saucepan and stir in the curry powder. Cook on a high heat for a good 2 minutes to toast the curry powder and release the flavours. 4. Stir in the flour and cook for a further 2 minutes then gradually add the stock, stirring continuously. Bring to the boil, reduce the heat, half-cover and simmer for a further 30 minutes. 5. 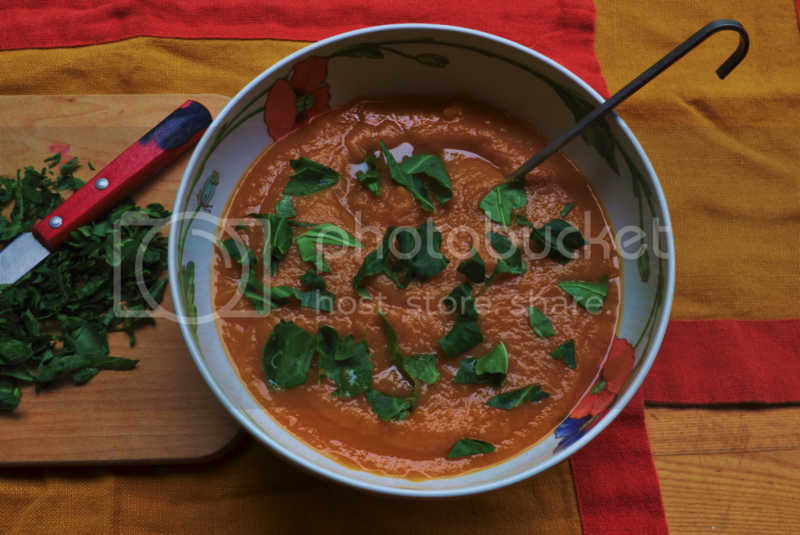 Leave soup to cool a little, then using an electric food blender or stick blender, puree the soup until smooth. Taste and adjust seasoning with LoSalt and freshly ground black pepper. Mix half the cucumber with the soured cream and season with LoSalt and pepper. 6. To serve, ladle the soup into warm bowls, and serve with a dollop of soured cream, some diced cucumber and a grinding of black pepper. Preheat oven to 160�C FAN/350�F/Gas Mark 4. Peel and slice 2 medium beetroot very thinly, then rinse in cold water and dry well on kitchen paper. Arrange on a nonstick baking tray and cook for approximately 25 minutes, or until crisp. Sprinkle with LoSalt and serve a pile on the side of each dish. LoSalt� is the U.K.�s leading healthy, low-sodium alternative to salt sold worldwide and in more than 4,500 stores in the U.S., including national chains such as Kroger, Whole Foods Market and Safeway as well as natural food stores and independents. LoSalt has 66 percent less sodium than regular table, sea and rock salts, but tastes just like regular salt. A great source of potassium, LoSalt is a natural product. It is a product of Klinge Foods Ltd., based in East Kilbride, Scotland just south of Glasgow. For more information, please visit their website http://www.losalt.com/us, become a fan at https://www.facebook.com/losalt and follow them at https://twitter.com/LoSaltUS.